Sampan is Philadelphia’s latest entry into the celebrity chef dining scene, with Michael Schulson at the helm. 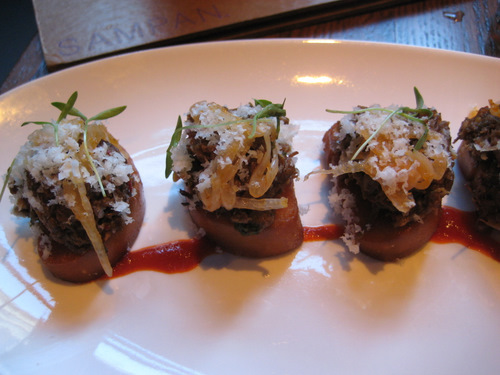 It’s a modern asian tapas type of joint, with asian inspired small plates. The place is pretty cool looking even from the outside. Look at those crazy wooden slats, they totally draw you in! It is a small plates place, and they recommend 3-5 plates per person. And each plate is not cheap. So get ready to spend! Here we have the edamame dumplings. 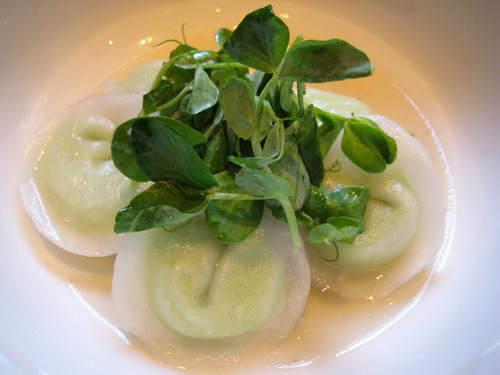 These little translucent pockets are filled with a puree of edamame. 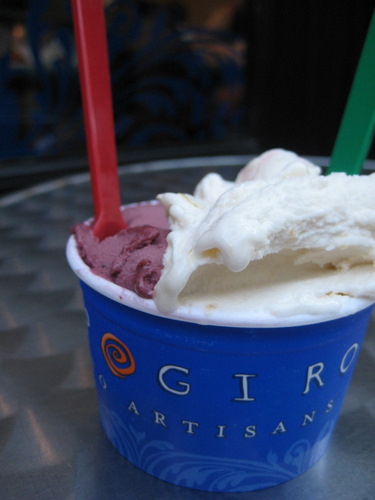 The consistency is very creamy and ricotta cheese-like. It is served with a very mild sake based broth. These are very different and delicious! Don’t expect tons of flavor, as these are quite subtle. 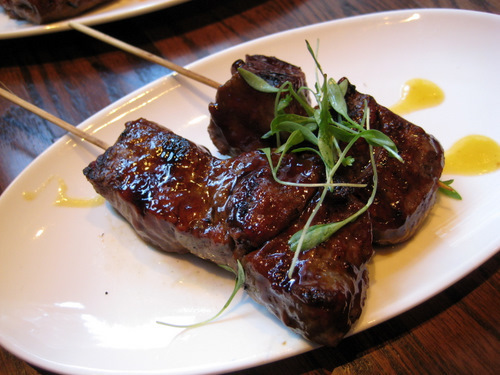 Here are the kobe beef satays, with apricot, soy, and mirin. These were pretty good, but I don’t know man, they’re awfully expensive for two teeny little skewers of meat. I realize that the kobe cows are massaged daily by their individual handlers and pampered and such, but I’m just not sure that’s worth it when you just put hunks of their meat on sticks. Here are some more meats on sticks that I can get a bit more excited about. 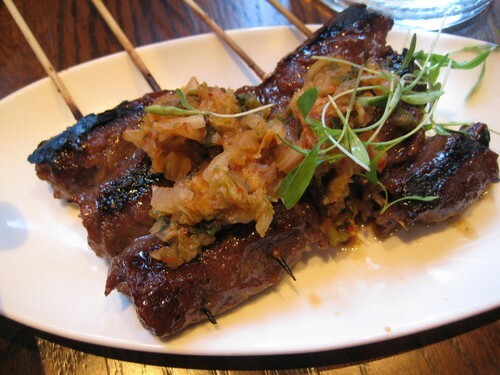 These are the korean BBQ beef satays. 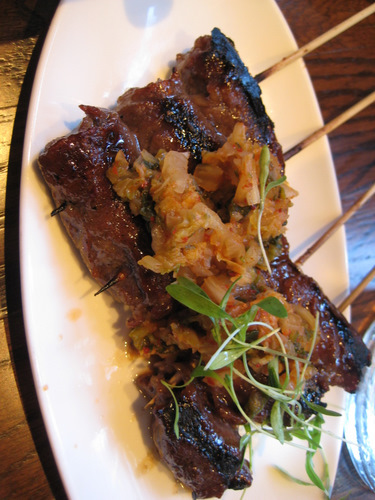 They’ve basically taken bulgogi, rolled them and stuck them on sticks, and topped them with kimchi. Yes sir, these were fantastic! 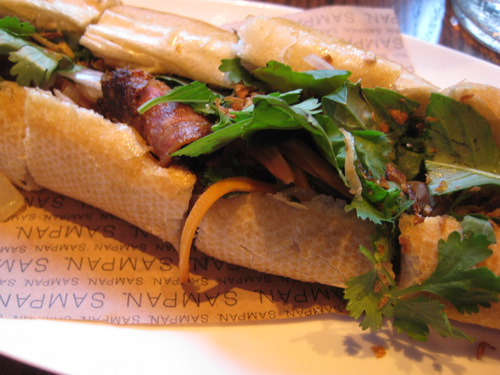 Here we have something with slightly more heft, the pork banh mi, or at least Sampan’s take on the banh mi. It has berkshire pork belly as the main ingredient, with the standard carrot, cucumber, and cilantro as fixins. This is not nearly like the banh mi you will find at your neighborhood vietnamese sandwich joint, but these are definitely yummy. They do not have the shredded daikon, which I love, so that kind of bummed me out a little bit. And there’s a sauce in there that’s not typically found in other banh mi. 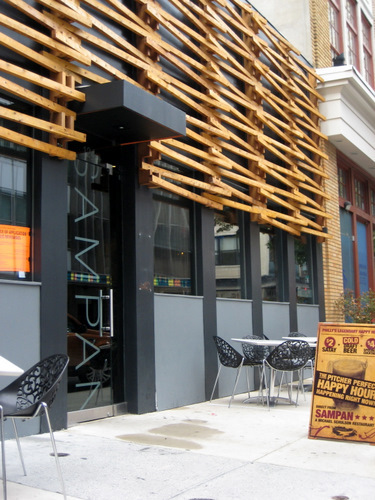 It’s also pricey for a banh mi, that’s for damn sure, but for Sampan, it’s one of their tastiest bargains. E was absolutely crazy about this, and this was probably her favorite dish of the night. Here is Sampan’s version of the “Philly Cheese Steak”. It’s got shredded beef plopped on little toasted buns, and are topped with shallot, cheese, and sriracha. These are a bit on the salty side, but I really enjoyed them anyway. The strong smell of the cheese threw me off initially, but then once my nose got used to it, I really found these to be quite delicious. I think this was probably my favorite of the night, along with the korean bbq satays. They don’t really taste anything like philly cheesesteaks at all, but I think that’s a good thing. We topped off the evening with a visit to Capogiro, my first all summer. I got half blackberry and half yellow plum sorbetto. Jimminy christmas trees, was this yellow plum some of the most fantastic frozen treats I’ve ever eaten in my entire life. I don’t know that I’ve ever eaten yellow plums, but if they taste like this, then sign me up! The blackberry was delicious as well, and really tasted intensely like blackberries, but the yellow plum just blew me away. Definitely thumbs up on both the dinner and the dessert!